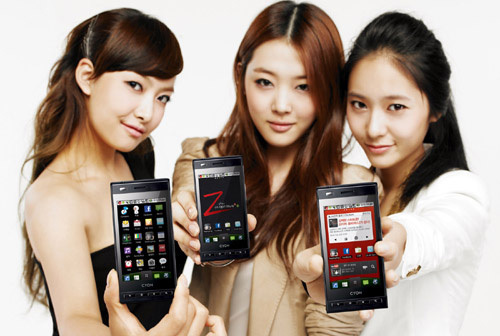 LG has launched for the Korean market, the latest edition to LG’s Optimus Series – the Optimus Z (LG-SU950/KU9500) Android smartphone, which is also expected to be released globally later this year. The Optimus Z is the third device in LG’s Optimus Series, it is only 11.05 mm thick and differs with more angular design than previous LG smartphones. The phone has a matte metal finish and inside is powered by 1GHz Qualcomm Snapdragon processor, runs Android OS 2.1 on 3.5-inch (800 x 480 pixels) touch display, packs Wi-Fi 802.11 b/g, DLNA, Accelerometer sensor, TV tuner, a 5 MP camera and supports Dolby Mobile audio and DivX video. LG Optimus Z offers “On Screen Phone function”, which allows the phone interface to be displayed on the screen of PC, using Bluetooth or a data cable and allows you to manage the phone’s features. Also the phone’s Drag & Shake function, let you share and transfer files with a “simple shake of the handset”, while LG’sAir Sync service will kept them in sync. It comes with two 1,350mAh batteries and pre-loaded with more than 100 applications, 70 of which are not available in the Android Market. LG also announced that plans to launch more Optimus devices and a Android tablet in the fourth quarter of 2010.